A dog-race is a sport run by greyhounds. The dogs chase a mechanical lure, typically an artificial bone, which is traditionally called a hare. The hare is started about half a circuit behind the start. When it passes a point near the starting traps, it automatically triggers the gate and releases the dogs. Should the dogs catch or overtake the lure, the stewards declare the race void. 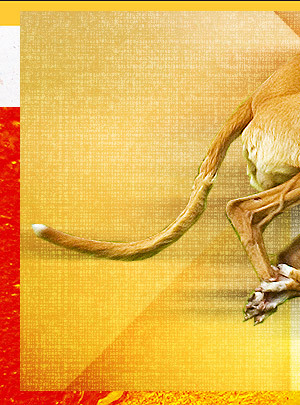 Greyhounds can cover 480 meters in approximately 28 seconds, twice the speed of a typical athlete. The minimum age at which a greyhound may run on all tracks is 15 months and will usually be at its best when 2½ to 3½ years old. Although the dogs are normally docile creatures, they become very excited when they race, and there are times when a runner may turn its head aggressively on another runner. 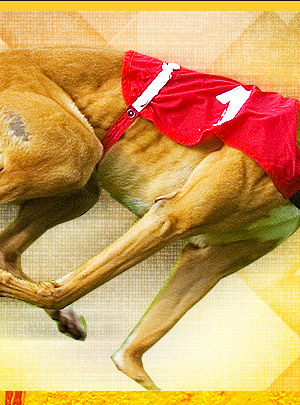 It is for this reason that the competitors wear muzzles when they race so that they can't do harm. The winner of a dog-race is the greyhound whose nose first reaches the winning line. The position of the feet is not taken into account. 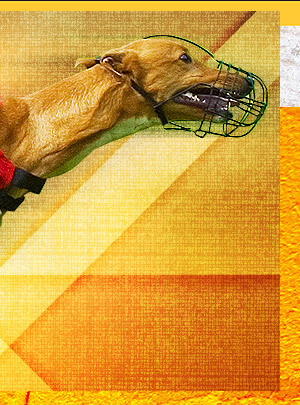 Dog-race finishes are photographed and where the result is close the judge examines the negative or a print before declaring the order of the finish. The most popular dog-racing surface today is sand. At one time, grass was the norm as this was both picturesque and fast-running. However, it became too difficult and expensive to maintain in a satisfactory racing condition through the winter. Sand, on the other hand, is cheaper and easier to keep in good condition. 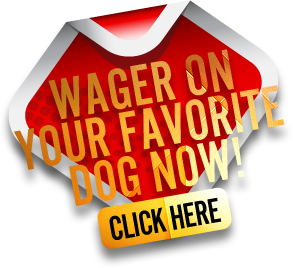 Place a bet on dog races now. The first dog to cross the finish line wins. If you wager to win, you collect only if your selection finishes first. The second dog to cross the finish line places. If you wager to place, you collect only if your selection finishes first or second. The third dog to cross the finish line shows. If you wager to show, you collect only if your selection finishes first, second or third. Winners of the 1st and 2nd races ( you must make your selections before the running of the 1st race). The first two dogs to cross the finish line in any order. Example: a 1-2 Quiniela could finish 1-2 or 2-1. The first two dogs to cross the finish line in EXACT order. Example: a 1-2 perfecta MUST finish 1-2. Early Speed / Front Runners. There are two types of early speed dogs. One type shows a strong break out of the box -the break call is approximately four lengths from the starting box. The other type tends to break moderately and then rush or drive the first turn. Late Speed / Closers. Late speed dogs generally show a somewhat slow break out of the box. They come to the 8th call following the pack. From here on out is where the closers run their race. Some may show a gradual gain throughout the race, while others, which I refer to as drivers, wait until late in the race to make their move. This type of a runner pushes hard in the stretch passing many of the dogs and should never be underestimated. Trouble. How many times have you heard "If he wouldn't have gotten into trouble, he could have won." Trouble to me is the toughest variable you will find in handicapping. "It is found in every race." Sometimes with only one or two dogs, but usually several. Coming into the first turn is where most of the trouble occurs. This is where the early speed/front runners can benefit by being out of harms way. The positive aspect of trouble is that it produces the higher payoffs. When selecting your key greyhound in a wager, consider his trouble percentage. If he shows a high percentage of trouble and doesn't seem to benefit by his post-position, look to another greyhound as a key. Track Preference. Knowing where on the track a dog likes to run can be very important. Out of the starting box, some may reach this area without causing trouble. Others may tend to slash or cut to the rail or outside. A dog that tends to run the rail and is positioned to the right of a mid-track or wide runner may find it hard to make their way around the other. This is true especially if both dogs tend to break the same. Some handicappers will play off this type of a situation, looking to a competitor whose running style and post-position will keep him clear of any possible trouble. © 2003 - 2019 Dog-Race.com may link to third party websites and software, including additional promotional links.